Picture this... You're sitting by the pool, feet dangling in the water. The sunscreen has been liberally applied and your big, floppy hat is slowly swaying in the light breeze. Life is good but you have a thirst that water can't quench. These slushy strawberry daiquiris are just what you need. Sharing recommended, but not required. If you order a strawberry daiquiri at a chain restaurant, chances are it will be an overly sweet drink that barely resembles an actual daiquiri. The original daiquiri was a combination of white rum, freshly squeezed lime juice and sugar served over ice. Over time, people have experimented with the daiquiri recipe using various types of fresh fruit and even frozen mixes. One of the more popular variations is the strawberry daiquiri. Some recipes use fresh strawberries while others are made from pre-made mixes that are full of sugar. Avoid these overly sweet pre-made versions of daiquiris and make your own instead. 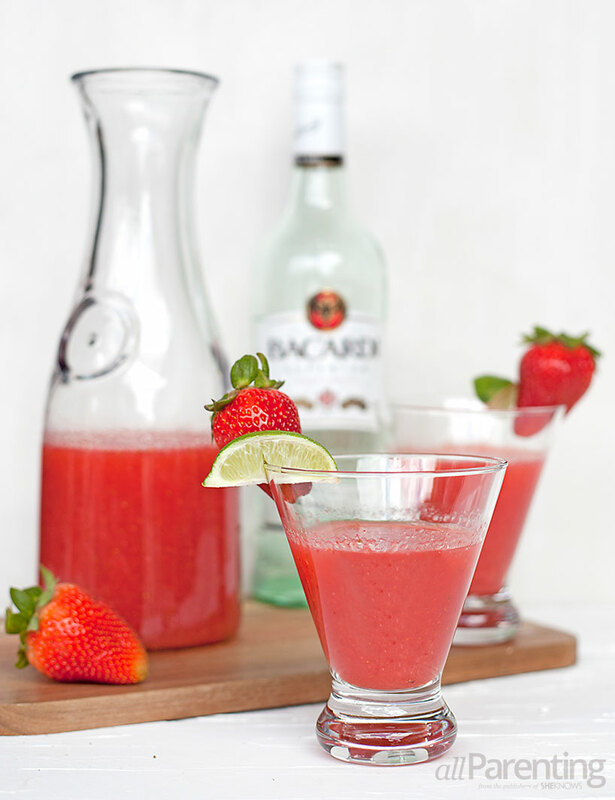 In this slushy strawberry daiquiri recipe, fresh, organic strawberries and limes are combined with Bacardi white rum. This results in slushy strawberry daiquiris that stay true to the original recipe and are absolutely perfect in the summertime. We won't blame you if you don't want to share! Pour white rum, strawberries and freshly squeezed lime juice in a blender. Add ice and blend to desired consistency, adding more ice as needed. Stir in simple syrup as needed to taste.